Still looking for the perfect cushions for your sofa? We’ve got you covered! Customise yours to match your sofa or go crazy with contrasting colours – get creative! Woven fabric, wool or velvet – whether you want a natural and textured or silky smooth finish, the choice is entirely yours with our wide range of materials and colours. Simply combine MYCS sofa modules to create an armchair, family sofa, or anything in between. Each section of your sofa can be customised with a wide range of fabrics, and three different leg styles to add additional flair to your piece. Get comfy on our sofas and armchairs. MYCS offers upholstered furniture in any size, tailored to suit your tastes. 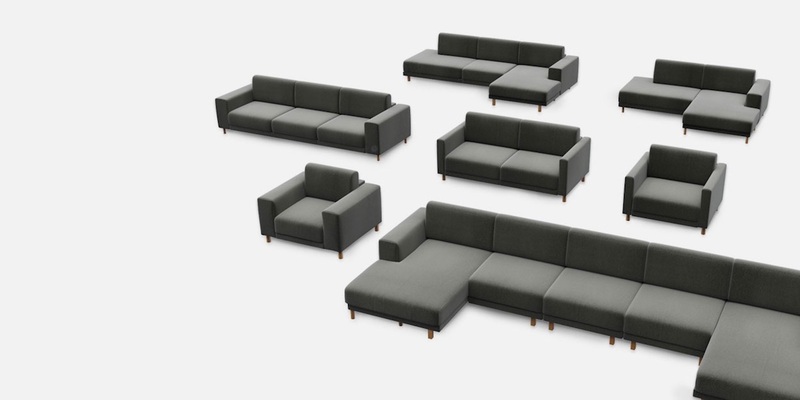 Thanks to our online configurator, you can design your sofas and chairs entirely according to your wishes. You can choose the dimensions of your seating, and alter the designs according to your space and the number of people in your household. So whether it’s an extra large corner sofa for the whole family, or a blue velvet chair - the perfect bedroom accent piece - you can create anything from the comfort of your own home with our 3D online configurator. You can also create armchairs that, thanks to our wide variety of fabrics and colours, either perfectly match your sofa or create an eye-catching contrast. Mix textures by combining velvet and wool, or opt for an understated finely woven fabric and add a touch of luxe with our matching cushions. So explore our products and get creative: with MYCS, you can be your own designer. Have fun creating your unique, luxury living room furniture!